CONTEXT: Bank and institutions are moving into the crypto-currency space, providing blockchain asset management services to their clients. This service requires the application of technologies and cold storage procedures that ensure agility and safekeeping of crypto currencies during daily operations. Private and public keys representing the wallets, are created on genuine and trusted hardware devices. They immediately deposit the secrets in secure hardware storage..
Funds are prone to attacks. Its fundamental architecture relies on multi-signature hardware wallets that can only sign multi-signature transactions in groups. Trader places order from or to the crypto wallet. Private key holders have a wallet device with a private key in the vault to sign transactions. 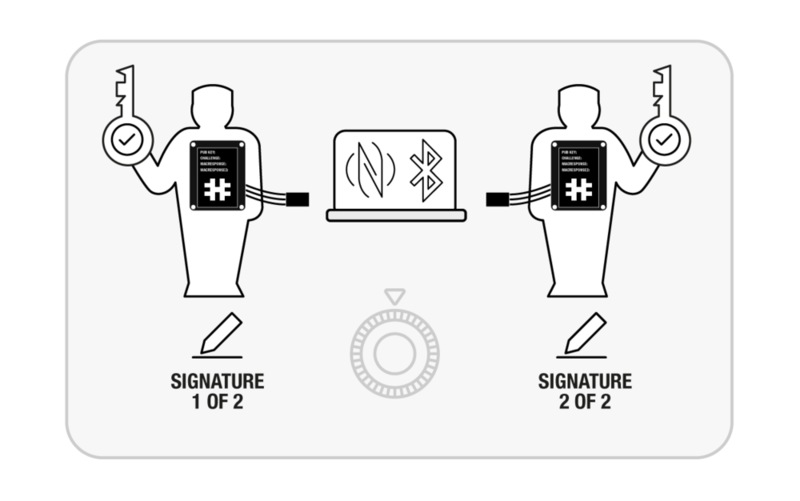 Two signatures are required to sign a transaction (multi-signature). Only authorized personnel is allowed to enter the vault room. Private key holders leave the secure data room with signed transaction and transaction form, which is handover to the trader.